Who should count as Jewish in America? What should be the relationship of American Jews to Israel? 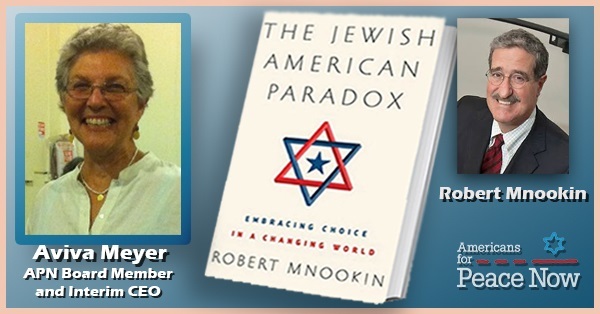 These are the questions my dear friend Bob Mnookin addresses in his new book, The Jewish American Paradox. I have known Bob since we were both 18 ( don’t even ask when that was) as I was his future wife Dale’s roommate as an undergraduate student at the University of Michigan. Before I continue, I should introduce myself to you. I'm Aviva Meyer, Vice Chair of the Americans for Peace Now Board of Directors. In addition to my role on the Board, I have been volunteering as APN's interim CEO while we complete a strategic planning process, after which we will hire a permanent CEO to replace Debra DeLee, who retired recently. I never thought I would find myself doing this after retiring from The New Israel Fund, but it’s a natural place for me to be. Like about 70% of American Jews, I am emotionally attached to Israel. Like many of the Jews that Bob describes, I am troubled by Israel’s continued military occupation of the West Bank and its discriminatory treatment of Palestinians. As an activist with Americans for Peace Now, I stand with the majority of Israelis, Palestinians, and American Jews described by Bob who favor a two-state solution as the best way to preserve Israel as both a democracy and a Jewish state. Bob's book has been released to excellent reviews. I believe you will find it fascinating and I urge you to read it. We are offering an incentive to APN friends like you. 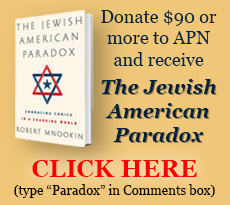 For a gift of $90 or more, we will send you Bob's book (write "Paradox" in the comments box - all but $15 will be tax-deductible). After you read it, do let me know what you think. I would love to hear back from you and so will Bob. You will be invited to a briefing call with him and other donors in which you will have the opportunity to talk to him about the book and the topic it explores. P.S., Remember to type "Paradox" in the comments section when you make your online credit card donation -- this will prompt us to mail you the book (all but $15 will be tax-deductible). Robert H. Mnookin is the Samuel Williston Professor of Law at Harvard Law School, the Chair of the Program on Negotiation at Harvard Law School, and the Director of the Harvard Negotiation Research Project. Before joining the Harvard faculty, Professor Mnookin was the Adelbert H. Sweet Professor of Law at Stanford Law School and the Director of the Stanford Center on Conflict and Negotiation. At Stanford, he chaired the Jewish Community Federation and served as president of the Stanford Hillel Foundation. Between 1994 and 2003, he served on the International Board of the New Israel Fund as its Secretary and Treasurer. 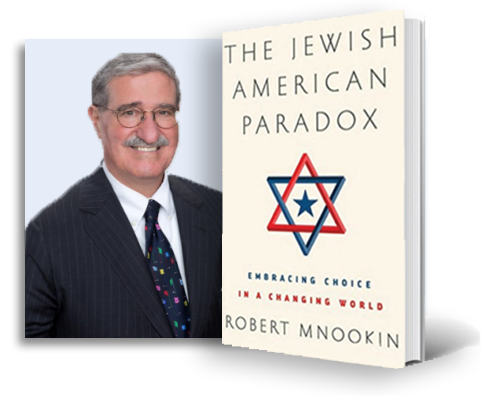 A leading scholar in the field of conflict resolution, Professor Mnookin is the author of nine books, including Bargaining with the Devil: When to Negotiate, When to Fight.